Robert Couturier is the ultimate embodiment of old school meets modern world. Raised in the elegant 16th arrondissement of Paris and educated at the prestigious École Camondo, he possesses a deep seated knowledge and love of French history and the decorative arts. And yet he is also a fan of Bravo reality TV and modern technology (be sure to check out his instagram feed). 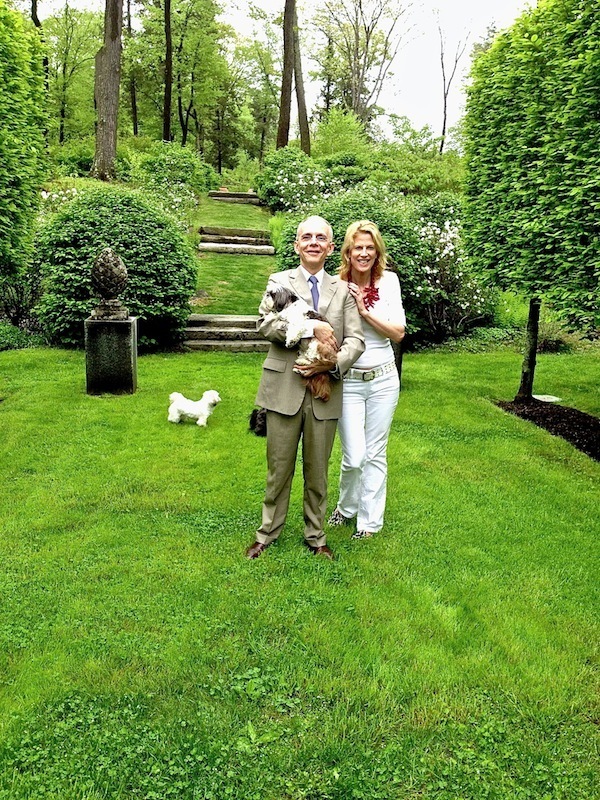 It is this delightful dichotomy, paired with a wicked sense of humor, towering talent and his dedicated devotion to an ever growing brood of Shih Tzus, that sets the designer apart. 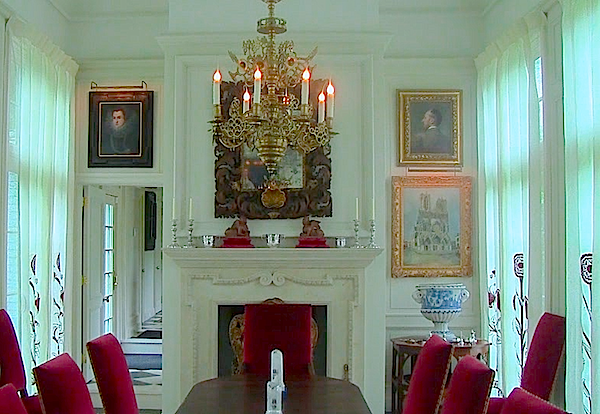 We were thrilled to be welcomed into his beautiful Connecticut home for the debut of our At Home with video series. Robert’s home, like the man himself, is the epitomy of elegance. While très raffiné, it is comfortable, personal and a perfect primer on how to live with what you love. An amazing collection of 18th century French furniture lives with pieces of all eras and origins. In the foyer, a locally made rustic chic copper mirror shares the stage with Louis XV table and chairs. 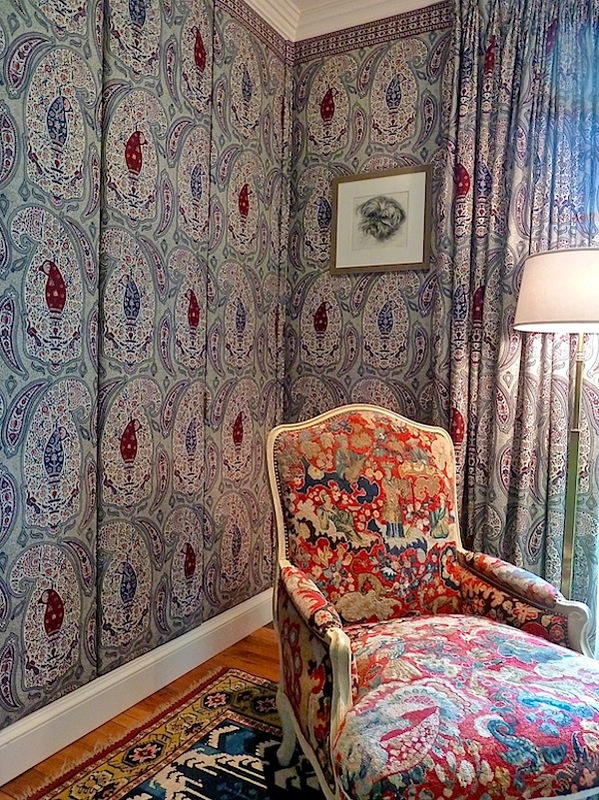 But his heart belongs to the classics as seen in the marvelous mix of textiles in his study, including the handsome Braquenié fabric on the walls, which he had Pierre Frey (owners of Braquenié) reprint from the archives. His new bathroom, currently under construction, will include a pattern which Pierre Frey (the founder of the firm, Patrick’s father) had used for Robert’s grandmother’s bedroom in 1934. A testament to the the power of timeless design. The luxury of bespoke appears often throughout the house. 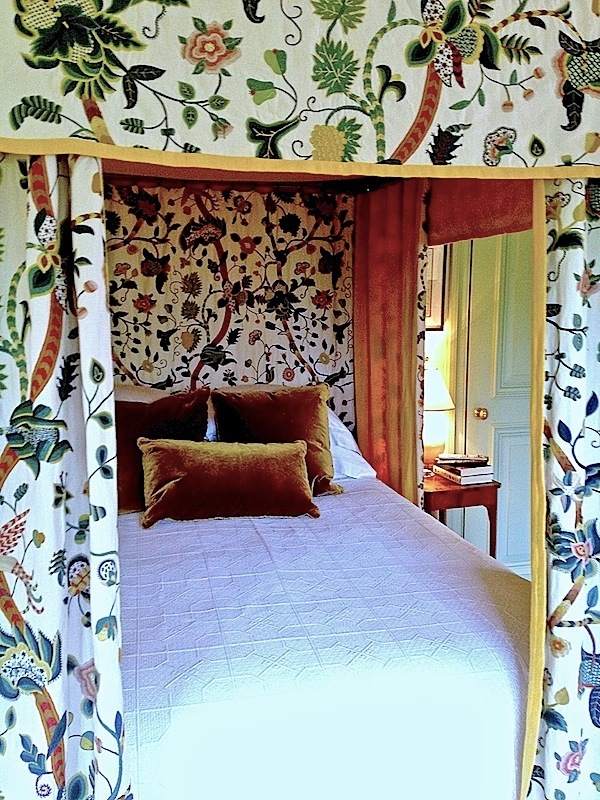 In the charming master, the bedhangings are custom from Chelsea textiles. where signs of active lives abound, offering glimpses into the past, present and future. 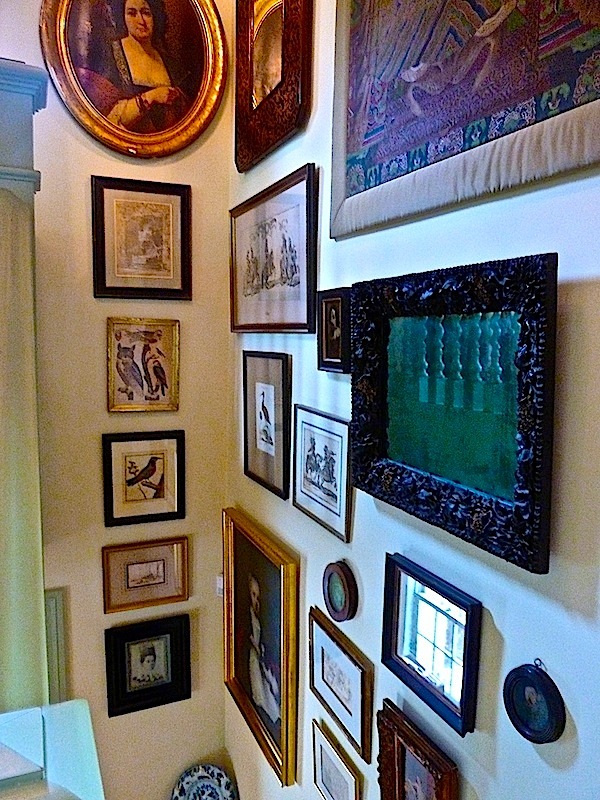 Art often tells the story and Susanna and I both admired this wonderfully eclectic gallery wall in a steep stairwell. 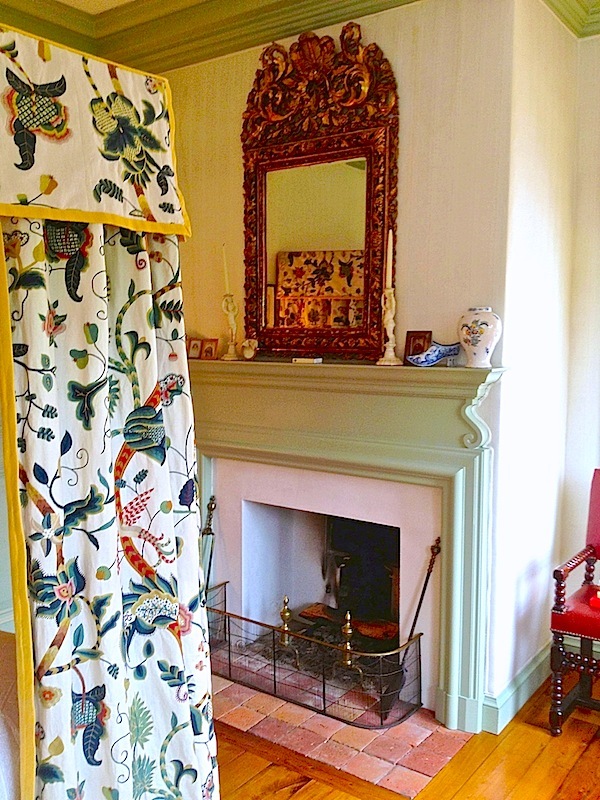 Enchanting animal prints mix with tapestries, art of provenance and family portraits, collected, like most everything in the house, by Robert and his partner, historic restoration consultant Jeffrey Morgan. Top left is a painting of Robert’s grandfather’s grandmother. the pantry is a history lesson in and of itself, including a service from the Duchesse d’Angouleme, daughter of Marie-Antoinette. 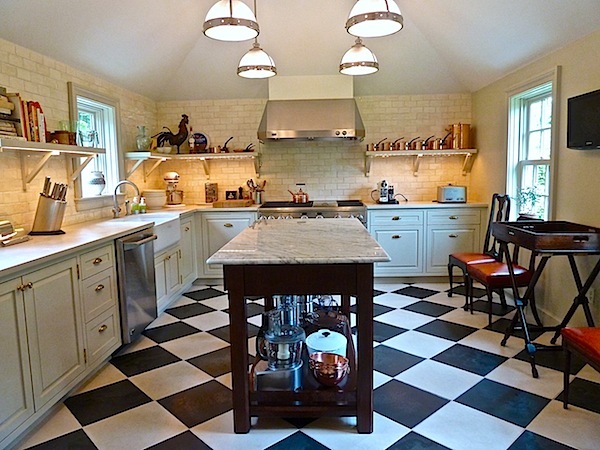 One of two kitchens, this one functions beautifully when entertaining, as Robert and Jeffrey do most weekends. Robert has designed prestigious projects around the world, including Sir James Goldsmith’s now famous 20,000 acre estate in Cuixmala Mexico which he worked on exclusively for five years. And while most of his commissions are grand in scale, they always include his signature style of continental elegance mixed with wit and whimsy. You only have to spend a few hours with Robert to understand he is a man with one foot in the past and one solidly in the present. A dashing figure in his custom tailored Savile Row suits, he can tell you not only every detail of each royal member in an 18th century portrait but also why he loves Eminem or the Real Housewives. Thank you Robert for a beautiful, entertaining and enlightening day. This entry posted in architecture, art, At Home with, furniture, garden, interior design, Quintessence video series, Stylish Shopping. Entry Tags: Decorating, Designer Homes, Home, interior design, Robert Couturier, Style, Top Interior Designers Bookmark the permalink. I am in awe —amazing talent combined with intense knowledge of all decorative arts. And a gentleman! Thank you. 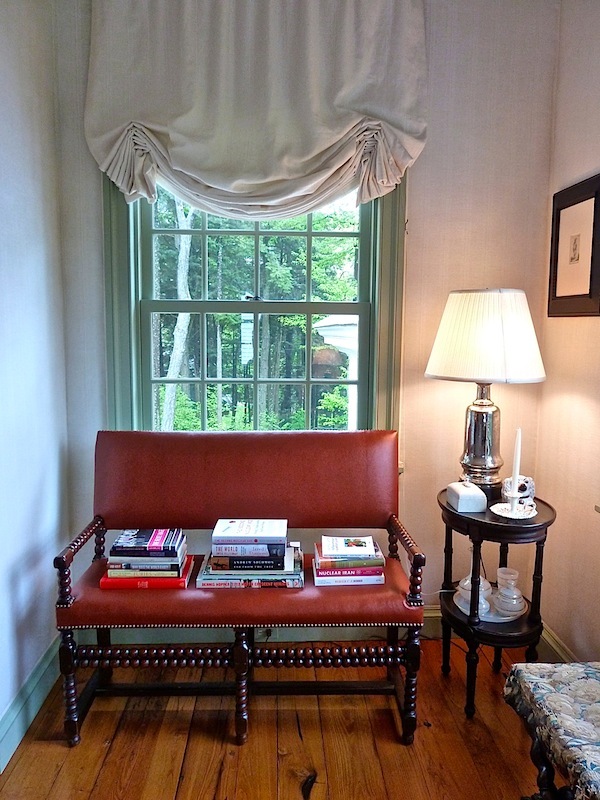 A beautiful well-lived home….love it. thank you. Wow! Exquisite! If your name is Couturier, there really is only one way to live… Thank you! Oh my gosh, Stacy! Forget keeping up with my favorites! So much beautiful here. I would start with the mirror and end with the curtains. Wow. What a remarkable home. Thank you for this amazing tour! 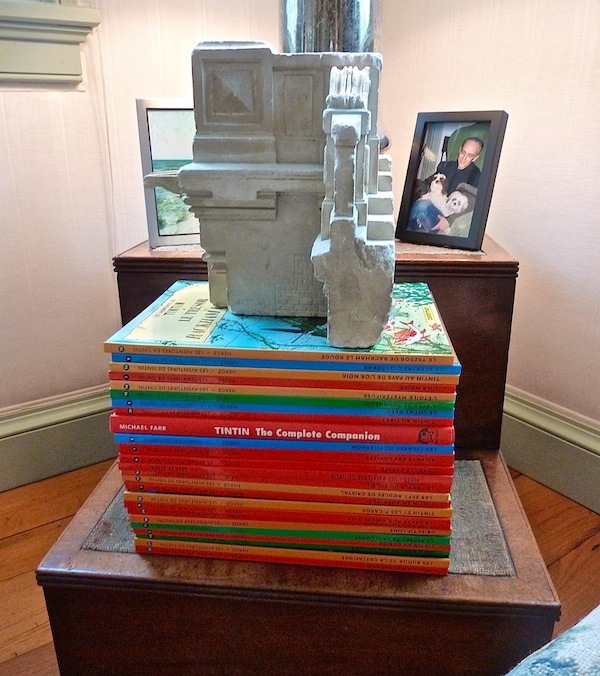 Hi – I have loved his work ever since I saw a room of his design at The Hamptons Designer Showhouse many years ago. I even wrote him a note to thank him for the experience! I am over the moon in love with that copper mirror!!! Oh boy – gorgeous! 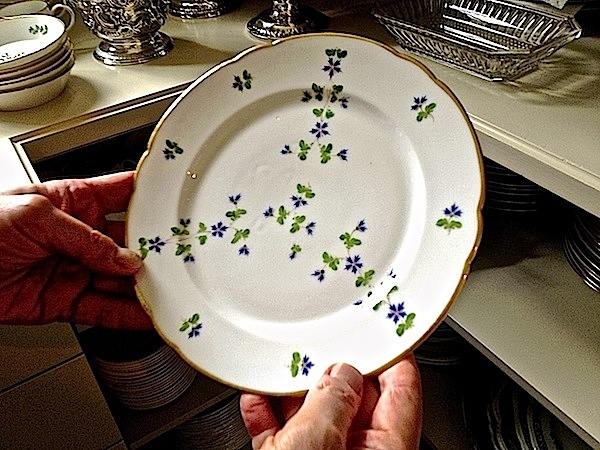 Love all the patterns in these photos :) Especially on that dinnerware! Beautiful home! I really am jealous of that kitchen! 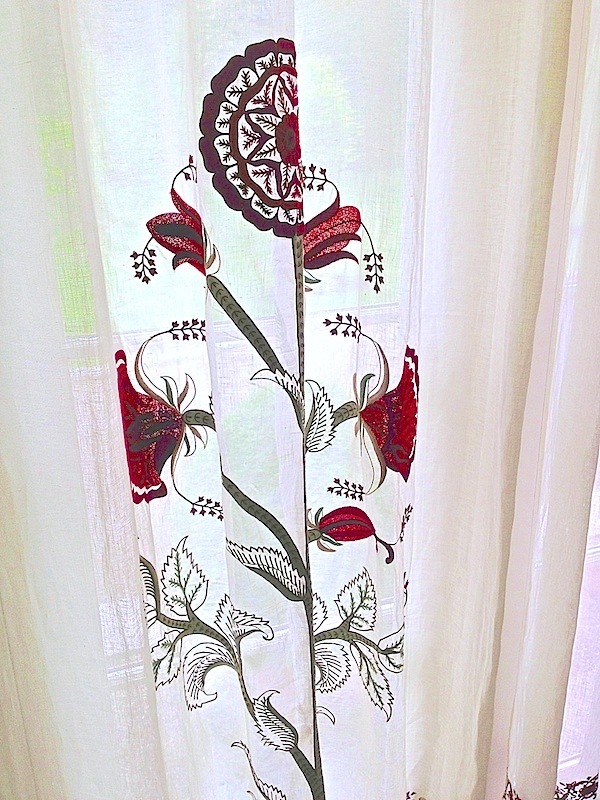 Dreaming of the curtains embroidered by Lesage! Having a 3D “Q” experience (video, text and photos) delivers a more jaw dropping experience than a mere magazine can! You made our day by giving us something to think and dream about! 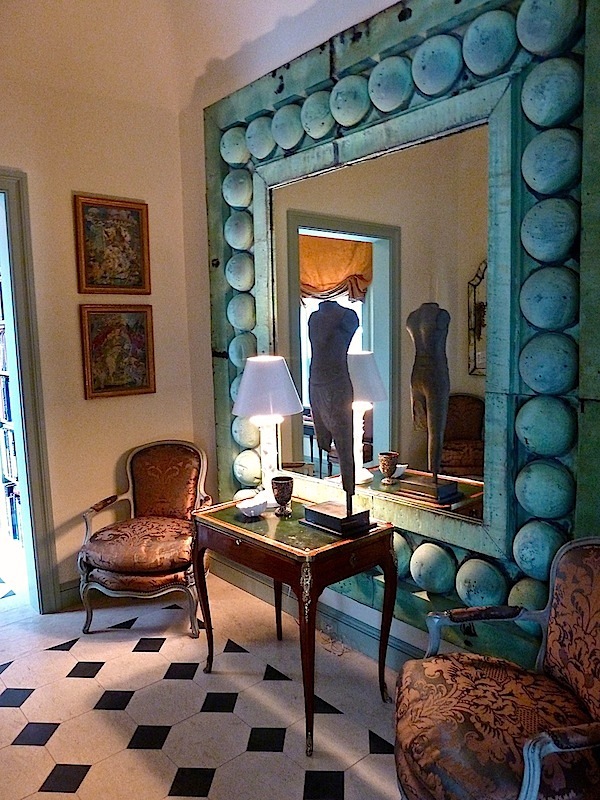 Completely and totally obsessed with the blue mirror in the entry way. It makes the entry way look so big and add a fantastic pop of color! What a completely enjoyable post! It’s always so fun to peak inside a creative life. Looking forward to more in the series. 81 queries in 0.618 seconds.